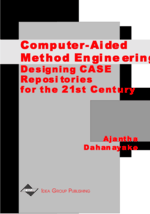 Historically the focus is on the theory of how problem-specific systems design tools can be supported by a Computer Aided Method Engineering (CAME) environment based on service object representation. To arrive at an implementation model, the conceptual model of the service object representation must be formalized. This theory is feasible when there is adequate computer support. Many researchers have emphasized strongly that requirement specification languages should have a rigorous formal basis; however, this need for formality has not been generally acknowledged in the field of information systems development. Most organizations and research groups tend to define their own methods using techniques advocated within such methods that often have no formal foundation. Discussions of modeling techniques are based on numerous examples, mostly using diagrams and notational conventions, to provide a popular style for the definition of new concepts and their behavior. In a CAME environment however, which gives the freedom to specify a modeling technique from scratch, it is difficult to avoid deficiencies such as inconsistency, lack of structure, over specification, incompleteness, ambiguity, and redundancy without using a formal approach. In automated support a formal model is used to provide stable specifications for implementation. In fact, an implementation can be seen as another, enormously detailed formal description, usually in an imperative programming language. To implement this sophisticated automated support, formal specifications of the CAME service description with adequate formal reasoning were derived earlier.